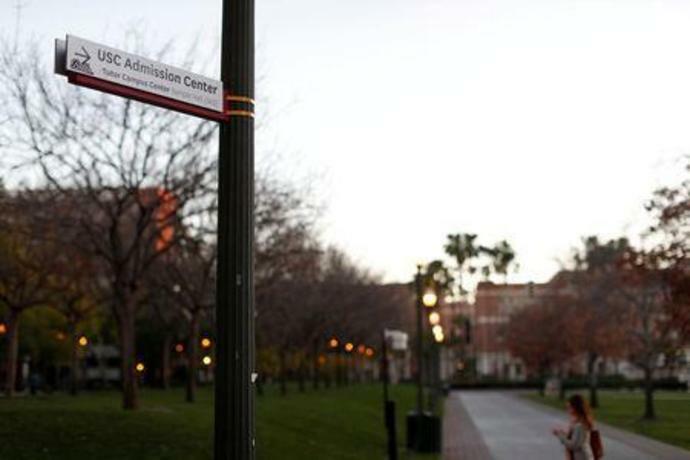 (Reuters) - The University of Southern California said it may expel students linked to the largest college-admissions cheating scandal in U.S. history after it completes a reviews of their records. The school said on Monday night that it has already "placed holds on the accounts of students who may be associated with the alleged admissions scheme," preventing them from registering for classes or acquiring transcripts. The move would affect the daughters of "Full House" actress Lori Loughlin and fashion designer Mossimo Giannulli. The parents were among 50 people charged last week for their alleged involvement in what federal prosecutors called a $25 million bribery and fraud scam. Prosecutors said some students involved in the scandal were not aware that their parents had made the alleged dishonest arrangements, although in other cases they knowingly took part. None of the children were charged. Pac-12 Networks' Greg Mescall breaks down No. 2 USC's 9-8 victory over No. 3 UCLA in Westwood on Saturday afternoon. Bronte Halligan and Lizette Rozeboom led the Bruins with two goals each, while Paige Hauschild plugged in four goals to give the Trojans the edge over their crosstown rival.